WATERLOO, WI -- (MARKET WIRE) -- March 19, 2007 -- Trek Bicycle Corporation, the country's premier bicycle manufacturer, is reintroducing millions of Americans to the joy of bike riding with the launch of its new Lime bike. Lime is the ideal bike for the casual rider who wants a fun, convenient and stylish way to run out for a cup of coffee or a breath of fresh air. With its comfortable, upright riding position, automatic transmission and pedal brakes, Lime is designed to ride the way we did as kids -- spontaneously, socially and to experience the sheer joy of motion. Hidden technology: Lime features the superior quality and elegant design Trek is famous for, coupled with cutting-edge Coasting™ technology developed by Shimano, the industry leader in bicycle components. While the 3-speed automatic transmission technology is sophisticated, its result is the simplest, easiest bike ride ever. A sensor detects the bike's speed and sends a message to a computer telling it to shift up or down. The turning of the front wheel generates the energy to operate the computer -- there are no batteries. The computer controls the selection of the perfect gear for the bike's speed and always returns to first gear at a stop. And all of this is hidden from view providing a clean, classic look. 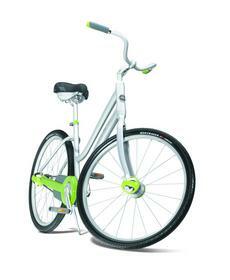 Lime is also equipped with pedal brakes; pedal forward and you go, pedal backward and you stop. It doesn't get any easier than that. Two miles, two wheels: It is estimated that 41 percent of the automobile trips taken in this country are for distances less than two miles(1). Lime is a fun, efficient alternative to a car, bus or cab for those short distance errands. With a bike using only 35 calories per passenger-mile compared to a car's whopping 1,860(2), if only half of those brief trips were accomplished by Lime rather than a motor vehicle the energy savings would be enormous. Fresh air, exercise and an enhanced connection to your neighborhood and neighbors are all additional benefits to living the Lime life. Personal expression and customization: Owning a Lime will say a lot about you; you are casual and fun, social and socially conscious, fit and free. And the variety of options available to personalize your Lime will allow you to say even more. Choices in size, price and color allow you to pick the perfect bike for your build, budget and personal taste. Lime Peelz™ color kits, bells and baskets allow for further customization. Enjoy the ride: Lime's natural heads-up riding position, puncture-resistant tires, comfort saddle, ergonomic hand grips, stable frame geometry, ease of operation and virtually maintenance-free mechanics combine for a riding experience that frees you to enjoy the scenery, socialize with your riding companions and focus on the sheer joy of the ride. Bike riding the way it used to be. Bike riding the way it can be again. Where can I get one of these? Lime bikes are available in two models, Lime and Lime Lite. Both versions will be available at Trek retailers nationwide. For more information, visit www.trekbikes.com or www.trekbikes.com/lime.